Ricoh has today unveiled the 12-million-pixel GX200 digital compact to succeed the Caplio GX100 model. Features borrowed from the GX100 include a lens delivering the 35mm viewing angle equivalent of a 24-72mm lens. Claimed improvements include enhanced noise reduction using the new Smooth Imaging Engine II image processor. Features also include a 2.7in LCD screen with a 460,000-dot resolution. The larger buffer memory allows continuous shooting for up to five raw-format images and there is now the option to shoot square format ?1:1? images in raw format. A Ricoh spokesman said: ?It is also now possible to use the bracketing function to automatically change exposure settings when shooting in raw mode.? He added: ?Flash functions have been further expanded with a light intensity adjustment function (-2.O EV-+2.0 EV), a manual flash function in which intensity can be set and a flash synchro setting where flash timing can be set as ?1st Curtain? or ?2nd Curtain?. An electronic level indicator is included to help keep the camera level when composing images in landscape or portrait format. Ricoh has also added a white balance compensation feature and autoexposure bracketing is now possible in a choice of 1/2 or 1/3 EV steps. In addition, the GX200 boasts a ?distortion correction? function designed to automatically correct image distortion while shooting, claims Ricoh. The newcomer includes a maximum equivalent ISO of 1600 and the minimum ISO has now been lowered to 64. 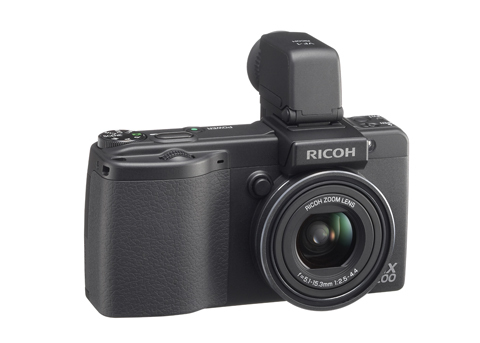 The Ricoh GX200 is due out in July priced £399.99 in a kit that includes a removable and ?tiltable? VF-1 electronic viewfinder (pictured) – also used on the Caplio GX100. The viewfinder (available separately priced £79.99) is designed to deliver 100% coverage and display the same information as shown on the LCD display. The camera alone costs £349.99. Ricoh made it clear to AP that it wants to ?sit above? the £200 compact market, aiming squarely at photographic enthusiasts and those who want to take ?candid? photos. It also hopes the GX200 will appeal to professional photographers seeking a back-up camera. Accessories will include 135mm (in 35mm terms) tele conversion lens with built-in hood. Also new is a lens cap that opens and closes automatically with the movement of the lens. The tele conversion lens and lens cap can also be used on the Caplio GX100. Prices for the new accessories had yet to be confirmed at the time of writing.